It is the year 2095. All of the brown people are dead, dying, or insignificant. Sounds like something out a science-fiction film, right? That’s because it is! Science-fiction has brought us stories of alien invasions, vampires, witches, ghosts, werewolves, and fairies. Basically, sci-fi brings the world of fantasy and the “what-ifs” to life. Three themes in the science fiction world that have been growing in popularity in the past few decades are the apocalyptic, post-apocalyptic, and dystopian themes, all which are usually set in the distant future. Apocalyptic sci-fi are stories that take place at time of the end of the world, in the midst of the world ending. The stories feature characters who are dealing with events of the apocalypse as it is happening and the decisions they make to either escape or to create a better life. Interstellar starring Matthew McConaughey and Anne Hathaway is a perfect example of this. Post-apocalyptic sci-fi are stories that take place in a time after the apocalypse or the end of the world as it was previously known. Post-apocalyptic sci-fi usually has characters that often flashback or remember a time when the world was normal up until the moment of the apocalypse. A perfect example of this is the Walking Dead where the characters are living in a world with far more zombies than humans. We know that something happened that ended the world the way the characters knew it and is causing the characters to now fight for survival on a daily basis. Dystopian sci-fi are stories that are often confused with post-apocalyptic stories. Dystopia literally is the exact opposite of utopia–utopia being the perfect world. Dystopia translates to a horrible world or hell on earth. In dystopian stories, there is a society in which the people in it are living a miserable and oppressed life. The oppression is usually brought on by a totalitarian government of some kind. An example of this would be the Hunger Games where the characters are living in dehumanizing conditions and is in total control by the Capitol. So now that we got that out of the way, let’s talk about the lack of brown folks in these popular genres. To be fair, I do believe that the Walking Dead has employed some really good actors/actresses to fill the roles of brown characters. I won’t even get into the One-arrives-another-Dies rule they seem to have going on over there. I’ll give this show a pass…for now. I’ve gotten into a few debates with friends over some recent movies that have hit theaters. I rather enjoyed the film Interstellar. I’m a sucker for sci-fi so I make it my business to see as many as I can in a year. The film, Interstellar, is set in the distant future as the characters are trying to cope with the world crumbling and dying around them. Matthew McConaughey’s character, through some weird events, finds his way to a secret location of an underfunded and dying NASA. Fast forward: He, Anne Hathaway, Doyle, and a black guy named Romilly are being swooped up into space to find a suitable home for the rest of humanity. Not too bad of a ratio, right? 3:1. What bothered me the most wasn’t that we only saw two brown people with speaking roles in the whole film (the other being David Oyelowo as the school principal for 2 minutes). What bothered me was that the one brown guy who was part of the “search for life” mission wasn’t even given a story arc. Matthew was a former pilot, so he had at least some experience with flying machines. Matthew’s character had his family to live for. He spoke to his daughter and son as often as he could while in space. His character was given depth. Anne is an astronaut and also the daughter of Dr. Brand, played by Michael Caine, the director of NASA. She, too, makes it her business to contact her father as often as she can while in space. She breaks down a few times and constantly goes above and beyond to make sure the mission is a success no matter the cost. Her character, like Matthew’s, is given depth. The other astronaut, Doyle, dies too soon in the film to get any real background on him. But what about the black guy? 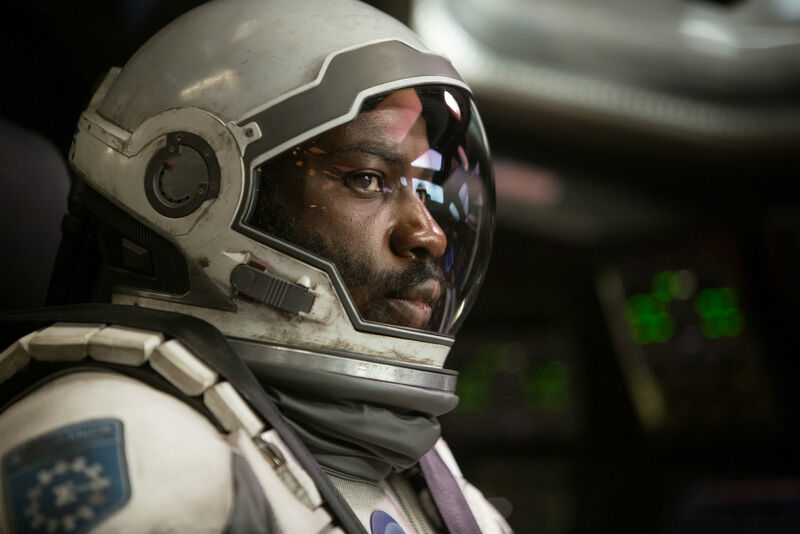 Romilly, played by David Gyasi, is an astronaut and physicist on the ship. He remains in the film for almost its entirety and we get absolutely no information on him. As Matthew and Anne struggle with completing the mission, missing their family on Earth, and the pressure of saving the world, Romilly is just sort of…there. He isn’t fighting with the others for time on the monitor to talk to his spouse or kids. He doesn’t mention anybody waiting for him back on Earth. He doesn’t really do much outside of work with his fellow astronauts on completing the mission. When Matthew and Anne land on a planet only to be met with tragic difficulties, Romilly stays behind, aging over 23 years due to the time difference. He later dies towards the end of the film in an explosion. Romilly’s character could have easily been alongside Matthew as the other lead in the film, giving him the perfect opportunity to catapult into stardom…but that’s neither here nor there. At the very least Romilly could have been given a family–a few black faces could have appeared on the monitor of the ship as a broadcast from Earth to show that there are at least a handful of brown people still living during the apocalypse. And what about David Oyelowo as the school principal? Are we to assume he was the last brown person and died off in the passing decades while Matthew’s crew was in space? Why are the brown people in Interstellar dead, dying, or insignificant? The same questions can be asked in many other films. 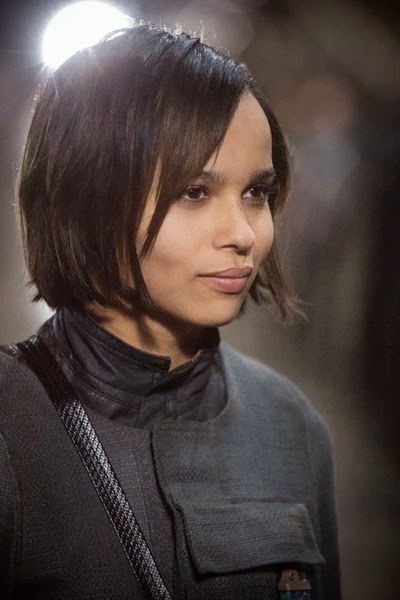 Mad Max (2015) featured Zoë Kravitz…the one brown face in the bunch. Are we to assume that there are no other people of color existing and surviving in this post-apocalyptic world? Did they all die out from some strange viral strand that only attacks brown people? And if so, is Zoë immune? In the dystopian world set up by Veronica Roth in the Divergent series, none of the main characters are people of color. This world is set in the distant future in Chicago, Illinois. Chicago has a pretty large percentage of people of color, white people only being at 45%. Yet for some reason in the future, we can’t get any brown heroes? No brown main characters? Oh wait…there goes Zoë Kravitz again! I’m starting to believe Zoë really is the only person of color immune to whatever virus is killing off the brown people in the future. If so, somebody put this chick in quarantine NOW! Zoë sure knows how to survive in these films where brown people are M.I.A. Well, there was the one film where she dies from an alien attack. It was called After Earth and it starred Will Smith and Jaden Smith. Hmm…so Zoë dies in a predominantly black sci-fi flick? Wait a minute! Do you guys know of any apocalyptic, post-apocalyptic, or dystopian films/tv shows that have people of color in the starring roles? If so, I’d LOVE to know what you guys can come up with. Nova Sparks is a science-fiction screenwriter and author of the bestselling series, the DOME trilogy. Born and raised in the Bronx of NYC, Nova enjoys wandering around the city, chatting with friends, and watching Netflix. She can be found working on her next novel and developing DiverSciFi, the first convention to celebrate, promote, and encourage diversity in science fiction.